Here’s Hilda! 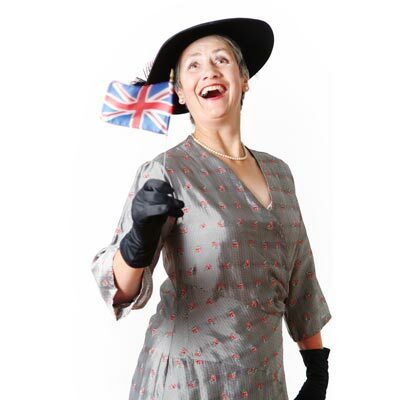 Is a theatrical portrait of Jan Bolwell’s grandmother, Hilda Blair Gardiner M.B.E an extraordinary New Zealand woman whose life spanned the twentieth century. A tall imposing figure with a booming voice Hilda strode through her life impervious to any obstacles. One of the first woman drivers in New Zealand, she drove as she lived — in the fast lane! Outrageous and indomitable, Hilda was passionate about politics, the environment, driving cars, the royal family, and serving her community through a variety of organisations. She was born into a farming family on the Taieri Plain near Dunedin at the end of the Victorian era in 1896. A tall imposing figure with a booming voice Hilda strode through her life impervious to any obstacles. One of the first woman drivers in New Zealand, she drove as she lived — in the fast lane! 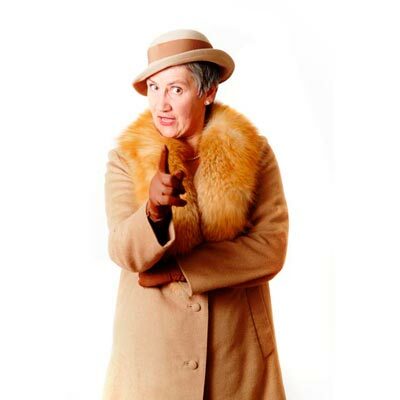 Hilda is a wonderful character to create a play around because she was a performer in every sense, and there were so many facets to her long life. 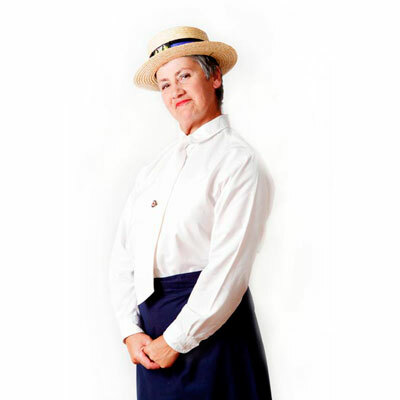 Telling her story gives audiences an insight into 20th century New Zealand social history. Hilda was a driver during the 1918 Flu Epidemic, a member of a WW1 concert party, a farmer’s wife during the Depression, a founding member of the National Party in 1936, and a leader in the ‘Fat For Britain’ campaign following the Second World War. Very specific and idiosyncratic stories blend with iconic moments in history to engage our heads and hearts at objective and subjective levels. I love a show that does that. Here’s Hilda! evokes a past that has very recently disappeared and it does so with loving, humorous and life affirming touches that never … become mawkish or mere decoration. 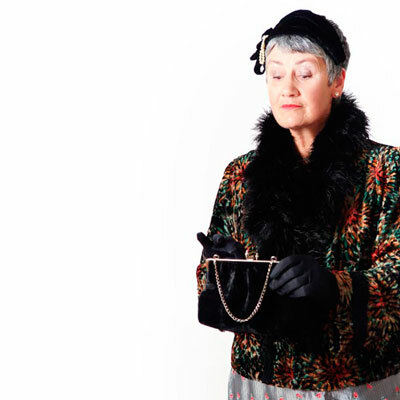 Yet again there is a must-see short-season show in Wellington: Jan Bolwell’s new solo performance, Here’s Hilda! Over 70 minutes — from her opening tap dance and the immortal line, “I died on Sunday morning last,” to the final, “Don’t forget the manure” — she paints a truly absorbing and often very funny portrait of her maternal grandmother, Hilda Blair Gardiner MBE (1896-1991). North Otago born and bred, on a farm, Hilda bore seven children in 9 years. While remaining based in Oamaru she made her indelible mark as a wondrously opinionated blue ribbon battler for good causes. Politically active and ultra conservative, she was nevertheless unconventional, an active multi-tasker and largely a law unto herself. Not given to conceding she was ever wrong about anything, she firmly believed the Reds had finally crawled out from under the bed at the advent of the Lange/Douglas Labour government in 1984: a delicious irony. Carefully crafted by Bolwell and her director/dramaturg Ralph McAllister, yet as light on its feet as Bolwell is in her brief dancing interludes, Here’s Hilda! is a beautifully structured and modulated journey through 20th century local history from an archetypal viewpoint. Very specific and idiosyncratic stories blend with iconic moments in history to engage our heads and hearts at objective and subjective levels. I love a show that does that. Memorable aspects and moments of the matriarch’s life include her hair-raising driving test, the hare soup for the Tokoraki Collie Dog Club’s 50th Anniversary Banquet, husband Arthur at war and returned, the Queen and Duke’s royal visit, her great pride at being a founder of the Dunedin Composting Society … As Here’s Hilda! compresses this remarkable life into seventy pungent minutes, it cannot help but fertilise our own memories and imaginations. And so it has come to pass, with new strengths in character acting added to the mix. Her first solo show, Off My Chest — about her breast cancer and double mastectomy — was mostly dance; Standing On My Hands introduced more acting; Here’s Hilda! is mostly acting, greatly enhanced by physical skills that allow Bolwell to fully inhabit old and young bodies. There is an important musical dimension too, blending the creative skills of such local luminaries as Jan Bolton, Laughton Pattrick and Michael Nicholas Williams. 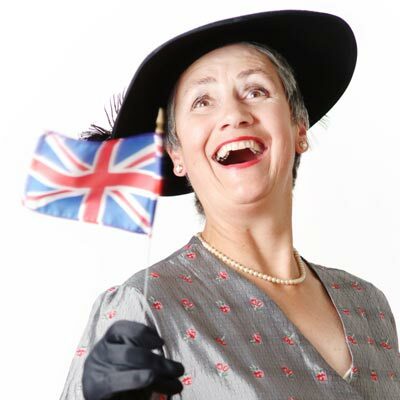 In her first solo play, Standing on My Hands, Jan Bolwell paid tribute to her father and his exploits during the Second World War. Four year on, she is back with another loving and very funny theatrical portrait from her remarkable family. This time her feisty grandmother, Hilda (from the German meaning Battle Maid, which says it all), comes under the spotlight as a woman of the land whose life covered most of the last century. She was born on the Taieri Plain in 1896, married a North Otago farmer in 1921, and bore her wild, headstrong brood of seven children during the Depression. She also found time and energy to throw herself into politics (a founding member of the National Party), the Fat for Britain campaign during World War II, the local Collie Dog Club, a compost society, and numerous community organizations. She was eventually awarded an M.B.E. for her services to the community. She died in 1991. Here’s Hilda! starts with Hilda watching and commenting on her funeral and joining in the singing of her favourite hymn, which is not surprisingly Fight the Good Fight. 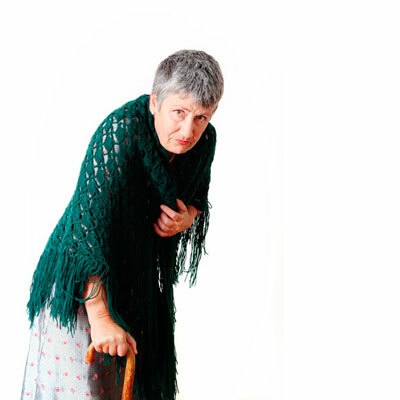 For the next seventy entertaining and touching minutes she tells the story of her life in a series of scenes that jump about in time so that her reminiscences of her days as a driver during the 1918 flu epidemic (told as a letter to her husband away at the war) are followed by her trip to Dunedin with her grandchildren to see the Queen in 1954. There are hilarious scenes about making hare soup, driving through Oamaru and scaring the daylights out of the local cops, performing with perfect elocution a patriotic monologue to the troops, and telling young Jan a thing or two about the evils of Bolshevism, the virtues of Keith Holyoake, and how it was only her husband threatening divorce that stopped her standing for parliament. Here’s Hilda! evokes a past that has very recently disappeared and it does so with loving, humorous and life affirming touches that never in the hands of Jan Bolwell and her director Ralph McAllister become mawkish or mere decoration. Hilda may have been a bit of a handful but by golly she led life to the full. Originally published in The Dominion Post. Reproduced with permission of Fairfax Media.